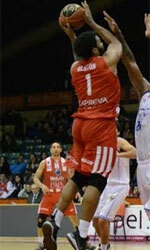 Frayles de Guasave (CIBACOPA) tabbed 27-year old American guard Durrell Summers (193-93kg-89, college: Michigan State). He moved there from CD Valdivia in Chilean LIBSUR where he started the season. In 24 games he averaged impressive 22.1ppg, 4.2rpg, 1.4apg and 1.3spg this season. He helped them to win the league title despite they ended the regular season at the second place. He can count that season as a very successful as was selected to Latinbasket.com All-Chilean Liga Nacional 1st Team and All-Imports Team. In 2011 Summers was drafted by Maine Red Claws (D-League) in second round (8th overall). The former Michigan State staris in his fifth season in pro basketball. Summers is a very experienced player. He has played also professionally in Australia (Illawarra Hawks), France (SO Maritime Boulogne), Hungary (Kormend and Atomeromu), Israel (Ironi Kiryat Ata), Venezuela (Trotamundos), D-League (Idaho Stampede, Reno Bighorns and Westchester Knicks) and Mexico (Rayos de Hermosillo). Let's have closer look into Summers' outlook: Possesses great length and is a true athlete. Summers can get to the basket past anyone, and often goes to the line because of it. In addition to his ability to drive, Summers hits the outside shot with ease and extremely efficient when spotting up or coming off the pick-and-roll. His size and strength make him incredibly hard to defend for smaller defenders, often creating a mismatch opportunity. His quickness and athleticism allow him to move well off the ball, coming around screens and creating space. Defensively his where Summers shines. His lateral quickness, length, and ability to change directions fluidly, while having the fundamentals and effort level to go along with it make Summers a great defender.